When you lose your footing and fall or slip, injuries can happen. In fact, accidents happen every day. But if you slip and fall and suffer a severe injury, does this mean you have a personal injury lawsuit? Here are some tips on how and where to find personal injury help. If you slipped while walking in your home or front yard, this is not grounds for a lawsuit. However, if you slipped while walking in someone else’s yard and they didn’t exercise responsibility in putting away an object, then this is grounds for a lawsuit. If you slipped on a wet floor while grocery shopping or from an object outside of a retailer’s store, this also may be grounds to file a lawsuit. Be aware…In ALL of these cases, you should always seek medical help first. Then, the second call on your list should be a personal injury attorney. Obviously taking safety precautions to prevent an accident is the best avenue, but it’s not always possible. Accidents are, well, accidents…and they happen. But there is a difference between a minor accident and a lawsuit. For example, if you are property owner, it is your obligation by law to keep your property safe. It is also your personal responsibility as a visitor to the property owner’s home to exercise caution when walking. Taking care of your medical needs is one thing, but a personal injury attorney can help you to collect damages and this includes your medical expenses. The law grants each party some level of responsibility and usually the case is decided upon whether you exercised reasonable care or whether or not the homeowner or shop owner used the necessary precautions to keep the property safe. The compensation is calculated based on the percentage of the liability. The court will use this amount to award the victim for damages. If you experience a slip and fall accident while at work, then the employer would be the one to sue. Most work-related injuries are covered under the worker’s comp laws in that state. 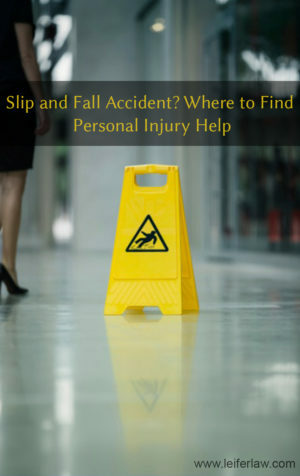 If you had a slip and fall accident of any kind, you should seek legal help from a personal injury lawyer. A good lawyer will help you to get through the ordeal and get you the compensation that you deserve. Contact Leifer Law firm today.